Thanks to everyone who joined us at our Repair the World, Makom Community, Challah for Hunger, Center City Kehillah collaboration event for Martin Luther King Jr. Day! We all joined forces to provide an incredible event for families and teens to create a more meaningful day for everyone . Beverly Socher-Lerner, from Makom Community, led a learning for the young kids. They read a book together and learned what it meant to be hungry. Rabbi Seth Goren, from Repair the World, led a learning for adults and teens that explored more complicated aspects of hunger and related hunger issues to Jewish texts. Both groups ended their sessions by making hunger promises: they wrote lists and drew pictures of how they were going to work to end hunger. Kids drew pictures of giving food to people in need, teens wrote about gardening their own food and giving out seeds so people could make their own food. It was great to see everyone be so creative! After the learning, we all came together to learn how to braid challah with Challah for Hunger. Kids filled their challahs with raisins and chocolate chips (mostly chocolate chips). Parents worked with their kids to braid and twist challahs, while teens taught each other how to braid. Everyone went home with bread ready to bake at home for Shabbat, or any other night. Overall, the event raised almost $300 for Mazon and Mitzvah Food Project. 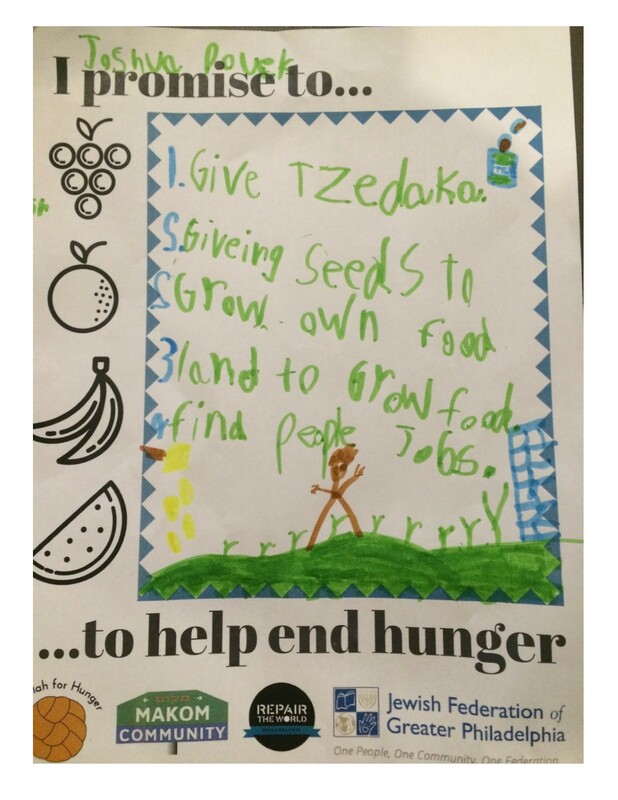 Mazon is the Jewish response to hunger and works to help people around the country have better access to food and the resources needed to have food security. Mitzvah Food Project, located in the very building that our event was held, provides services for people in the Greater Philadelphia area. It felt good to be donating to an organization helping people right in our own community. Thanks for a great day, and we hope everyone had a meaningful day of service!